Ecommerce reporting in Google Analytics is typically used to measure checkout performance or product revenue. However, by analysing events at the top of the funnel, we can see which products need better images, descriptions or pricing to improve conversion. Space on product listing pages is a valuable commodity, and products which get users to click on them – but don’t then result in conversion – need to be removed or amended. Equally, products that never get clicked within the list may need tweaking. Littledata ran this analysis for a UK retailer with Google Analytics Enhanced Ecommerce installed. 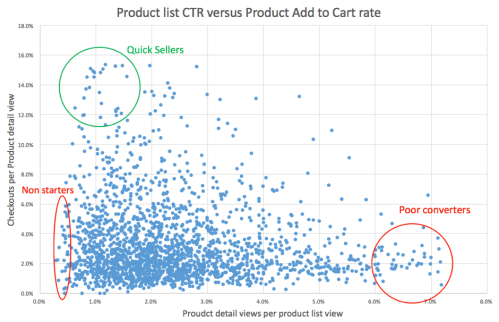 The result was a scatter plot of product list click-through-rate (CTR) – in this case, based on the ratio of product detail views to product listing views – versus product add-to-cart rate. For this retailer, it was only possible to buy a product from the detail page. Quick sellers: these had an excellent add-to-cart rate, but did not get enough list clicks. Many of them were upsell items, and should be promoted as ‘you may also like this’. Poor converters: these had high click-through rates, but did not get added to cart. Either the product imaging, description or features need adjusting. Non-starters: never get clicked on within the list. Either there are incorrectly categorised, or the thumbnail/title doesn’t appeal to the audience. They need to be amended or removed. We need three metrics for each product name (or SKU) – product list views, product detail views and product add to carts – and then add ‘product’ as a dimension. 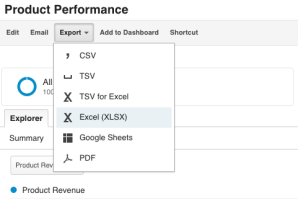 Google Analytics can’t do the statistical functional we need, so Excel is our favoured tool. Pick a decent time series (we chose the last three months) and export. This website is not capturing Product List CTR as a separate metric in GA, so we need to calculate as Product Detail Views divided by Product List Views. However, our function will ignore products where there were less than 300 list views, where the rate is too subject to chance. 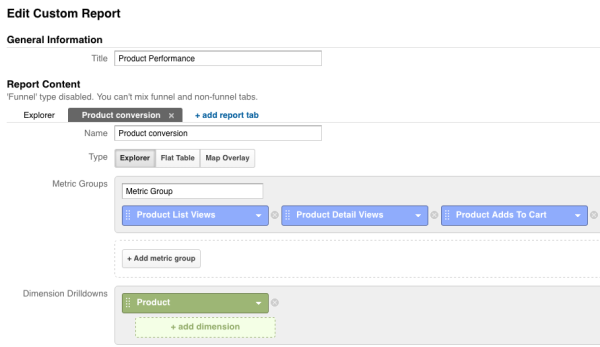 Here we need to calculate Product Adds to Cart divided by Product Detail Views. Again, our function will ignore products where there were less than 200 detail views. We will use an upper and lower bound of the median +/- three standard deviations to remove improbable outliers (most likely from tracking glitches). First we calculate the median ( =MEDIAN(range) ) and the standard deviation for the population ( =STDEV.P(range) ). Then we can write a formula to filter out all those outside of the range. Using the scatter plot type, we specify List > Detail rate as the X axis and Detail > Add to Cart as the Y axis. The next step would be to weight this performance by margin contribution: some poor converters may be worth keeping because the few sales they generate are high margin. If you are interested in setting up Enhanced Ecommerce to get this kind of data or need help with marketing analytics then please get in contact.